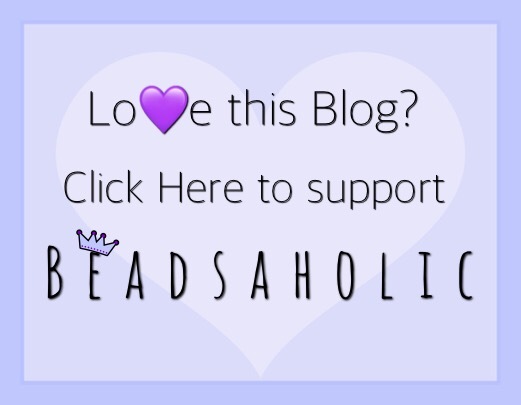 Today Beadsaholic brings a review of Trollbeads 2019 Mother’s Day release! 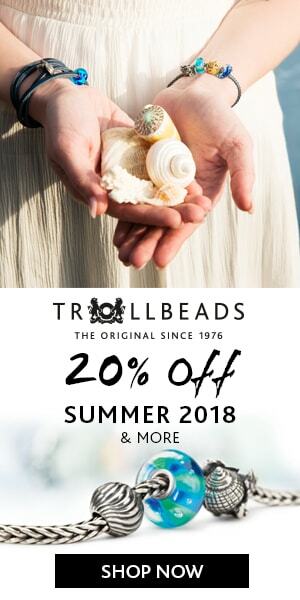 We are a little over a month away from Mother’s Day and Trollbeads has released two fabulous beads for this special occasion. Each year I always look forward to the Mother’s Day releases as they are always so beautifully done, and this year was no disappointment. I love this release. I for one needed more hot pink beads in my life! The Puzzle bead will also mean a lot to Mother’s around the world and especially to those who have children with Autism. Trollbeads Limited-Edition Flow of Love is a beautiful hot pink bead swirled with cream, white and glitter. This bead measures approximately 13.75 mm high x 8.31 wide and retails for $55 / €55, each bead comes in a beautiful pop up box and includes the puzzle. Trollbeads Puzzle Spacer is a rather cool puzzle stopper with one puzzle piece missing. I have only tried this spacer on Trollbeads bangles, and it fits nicely. I know some were concerned about the rubber being seen where the piece is missing; however, by the naked-eye it just looks like a dark/black space. This bead is close to the size of a standard Trollbeads Spacer measuring approximately 10.34 mm high x 4.88 mm wide and retails for $45 / €45. I spent some time in the art garden with my family while taking some photographs. It’s always a nice and relaxing place and the perfect backdrop for photos. In the next two photos I wanted to use some tropical colors like teal and Hot pink. So I went with a few beads from the spring release Flowers of Hope, Green Tulips, Seeds of Hope, Savoy Knot, alongside Silver Trace – Pink, Pink Diamonds, Flow of Love, Amazonite, Dancing Butterfly, Rose of June, Lucky Knot, Blanket of Love, Opposites Attract, Maternity, Mini Gold Heart and the Puzzle Spacer. I think maybe the retired crazy lace would go nicely with the Flow of Love; however, I like mixing different shades of pink together. So, in this composition I went with Rose Quartz, Strawberry Quartz, Love Birds, Maternity, String Spacer and Puzzle Spacer. Another spring mix of Teal and Pink. I truly love grey and pink together and Trollbeads spring release goes perfectly in this composition with the Mother’s Day release! Here are Trollbeads Flowers of Elegance, Savoy Knot, Pink Silver Trace, Opposites Attract, White Tulips, Life Circle Bead, Pink Diamonds, Triple Pearl, Flow of Love, Puzzle Spacer, Drops of White, Opposites Attract, Pink Silver Trace, Friendship Knot and Stepping Stones. This has been my favorite way to wear the new Trollbeads Mother’s Day collection with the Maternity, Mini Gold Heart, Opposites Attract, Pink Diamonds and Pink Silver Trace. Over all, this is a great release. I know some are not fans of pink, but as you know it’s the colors usually used for Mother’s day. I am personally happy to see more hot pink entering the collection that will go with some of my other beads. This release will be available on April 12, 2019 at the following featured retailers. I thought the glass bead would be a must have, but based on the live pictures I have seen so far: I don’t like it that much (but I do like the hot pink). I see a lot of variation in size and that makes it harder for me to like the bead. I like my collection of glass beads to be consistent in shape and size, and Trollbeads often has a lot of variation in size. I like the sizes to be more consistent, too. It may be one you will want to pick out in person or by photos. I find Faceted Glass to be more consistent though. I love the hot pink “Flow of Love” bead. Do you know if all retailers such as Perlen will get it? I love the Mother’s Day puzzle spacer. It means so much to so many people especially Mother’s. I am sure retailers like Perlen will receive this special bead. Me too, I’m so happy to see more pink! Hope to get it from Perlen soon. It’s a pretty bead. It’s worth seeing in person. I love the Mother’s Day puzzle spacer. Hope to get it at Perlen soon . I would like to see new Trollbeads in my favorite store https://www.perlenodense.com This bead so great! Absolutely love that puzzle piece spacer.